Porsche’s Tesla competitor, previously called Mission E, is now the Porsche Taycan. It’s coming in 2020. Update, August 2018: Porsche just released some new specs about the upcoming Taycan electric car. As expected the electric sedan will make more than 600 horsepower in total system power and come with 800-volt charging capability, which will give the car enough juice to go 400 km. (248 mi.) in just 15 minutes of charging. Overall, Porsche proclaims an electric range of 500 km. (about 310 mi.) and a 0-100 kph time of three and a half seconds. Porsche says it has built “three figures” worth of Taycan prototypes altogether. The name, announced during 70th anniversary celebrations for the automaker, apparently means “lively young horse.” It’s a reference to the prancing pony in the center of Porsche’s shield. Ever since 2015, when the German automaker publicly committed to turning its hot concept EV into a real production car, the project has been called Mission E—”E” for electric, of course. Porsche recently said it would make an SUV version of the Mission E, too. We’ll have to wait for the crossover’s official name, which we presume will not remain the Mission E Cross Turismo. Here’s what else we know about the Taycan, which is currently on schedule to be released in 2020. 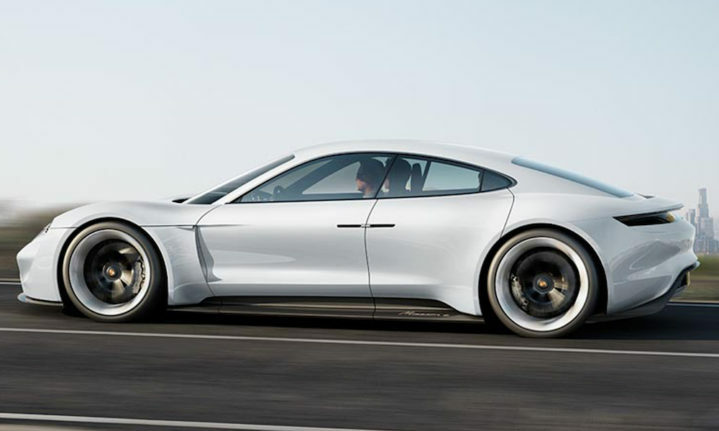 Porsche has an existing big sedan, the Panamera, but don’t suppose the automaker is simply going to toss in a big battery and electrify that car. The Taycan will ride on a custom-built platform called J1 with a big space in the floor for its hulking lithium-ion battery. The Taycan will come with multiple variants. Reportedly, the three initial power outputs offered will be 402 hp, 536 hp, and 670 hp. Porsche’s most ambitious play may be its move to outdo Tesla when it comes to high-speed charging. Whereas Mr. Musk’s superchargers offer 480 volts, Porsche is working on 800V infrastructure to charge the Taycan and its all-electric successors. That’s enough juice to take the Taycan 250 miles on just 15 minutes of charging. Look for the real production version of the Tacyan to emerge at one of the big car shows of 2019—perhaps Frankfurt, where the concept debuted.